Ray Johnson (1927–1995) was a singular artist, for whom life and work were inextricably linked. Born in Detroit, Johnson attended Black Mountain College before moving to New York, where his work anticipated Pop art and he was active in early Fluxus circles. Best known for his collages and Mail art activities, including his New York Correspondence School, he operated fluidly in a wide range of modes. For Johnson, everything and everyone were potential material for his art—any form could become a space for artistic activity—and the form of the interview proved no exception. 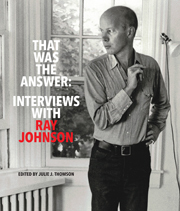 That Was the Answer: Interviews with Ray Johnson brings together a selection of eleven interviews and conversations from 1963 to 1987 that offer unique access to Johnson’s distinctive thinking and working methods. These materials, which include exhibition ephemera, an oral history, radio transcripts, and magazine articles, are marked throughout by his humor and close attention to language. Gathering these exchanges for the first time, That Was the Answer serves as an exceptional introduction to Ray Johnson as well as a resource for those who are interested in gaining deeper insight into the artist and his kaleidoscopic body of work. Julie J. Thomson is an independent scholar and curator based in Durham, North Carolina.